These lightweight pair of goggles were crafted for the Captain of an airship or dirigible. The left lens is a magnifier for map reading or other mundane tasks, accented with a small leather strap. The right eye features an adjustable targeting and sighting disc. Because you can’t have too many lens options. These feature a set of main internal lenses, capped with silver rimmed expansion lenses. The center has a pair of adjustable small focus lenses, and each corner has an adjustable magnification lens. Twin spring eyebrows give the leather base extra structural support. Fully adjustable elastic strap keeps them snuggled to your eyes and/or hat. 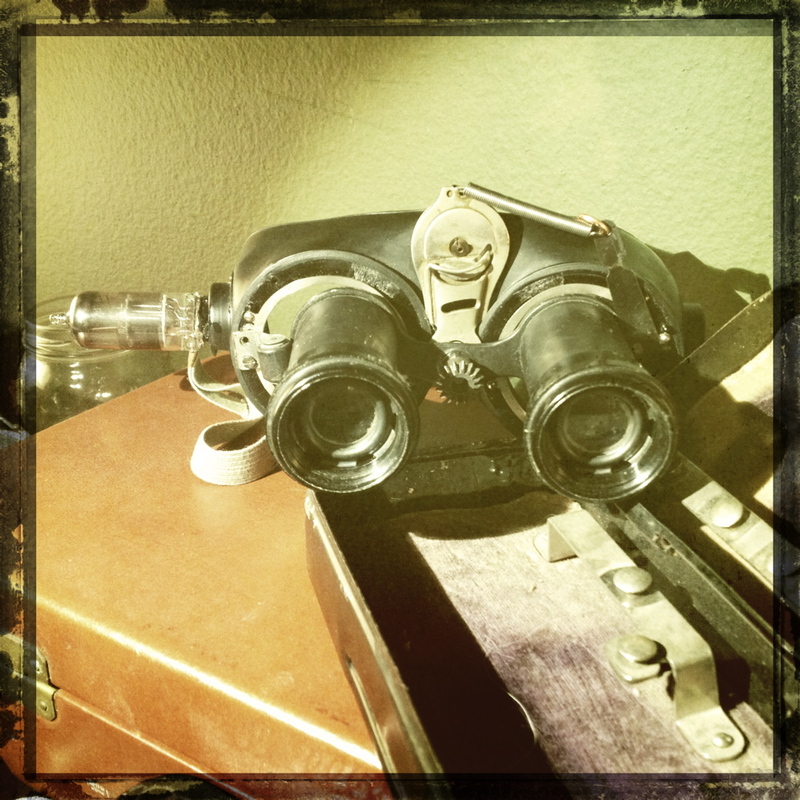 These goggles were discovered in a Dirigible Engineer’s old toolbox. They have a hard, green shell with a nice textured leather strap. On your right eye is some kind of alignment ring and two adjustable magnification lenses. The other eye has a device attachment made of shafts, one ending in a gear and a spring loaded arm. Not being a Dirigible Engineer myself I have no idea the purpose to this. It would seem to be another type of alignment mechanism, mayhap it attached into something allowing for minute adjustments. These seem the kind of goggles that when you need them they are the only device that will do that particular job, whatever it may be. Please note, this page is currently set up for international shipping. If you are domestic use the link on the homepage. Dual targeting zoom lenses surround a brass centering ring on the right eye of these ‘antiqued’ goggles. THe other side feathers a depth gauge and sight blocker to help focus on your target. Leather head straps wrapped with wire pull everything together. These are currently on loan, to possibly used in a wedding, if they come home I will offer them for sale. Here are the best pictures I have, in full res to show how the loupes were attached to the goggles.